It’s probably no secret that photographers like photography. But there’s a huge audience out there of non-photographers who are equally passionate about the photographic medium. This is a growing audience of individuals from many places and walks of life who are finding it hard to live without photography. Or maybe to be a little more fair, who appreciate photography’s unique ability to portray the reality of the world we live in today, the places where people lived yesterday, and the bounty of ideas and emotions and vistas that are not bound by any set time or chronology. Over the last number of decades, photography has become increasingly recognized as more than just a potent medium of expression and communication. Today it is considered a true form of art, as legitimate as any creation involving brushes and canvas, or other tools and technique that have been in existence for ages. As the perception in the art world of photography as fine art became more common, dealers, galleries and exhibition opportunities increased; values for photographic prints rose; and select photographers, representing a range of subject matter and styles, achieved fame (even if not fortune) and attracted what could in fact be termed a loyal following. The Association of International Photography Art Dealers (AIPAD) was begun in 1979. Based in Washington, DC, they are a membership organization promoting specific standards relating to the purchasing and selling of photography and a public awareness of photographic collecting. Their annual show - appropriately named The Photography Show - is held in NYC each year and offers a four-day experience, an almost unprecedented opportunity really, to view and purchase photography of all genres and at a wide range of price points. I have attended a number of times in the past, but thought that this year I’d actually photograph the event, with the goal of documenting how people interact with photographs – at least in this sort of venue. Probably in a private home or in a corporate office space it's somewhat different, but here at the show, in every single aisle, the interaction was palpable. I spent a total of nine hours on the Friday and Sunday of the 2007 show, which took place April 12-15 at the Park Avenue Armory in Manhattan. The idea of photographing people looking at photographs of people - or looking at landscapes, or still lifes, or any other subject - seemed appealing. Enough at least to invest the time I spent over two days. 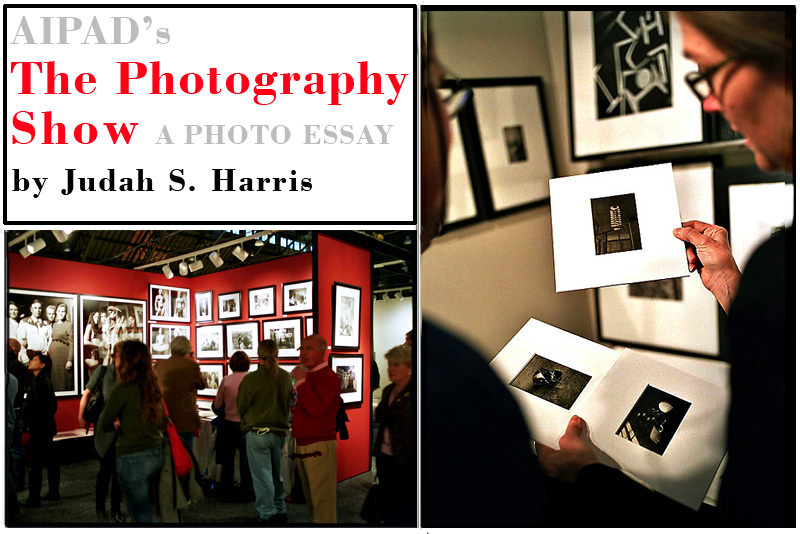 Here at The Photography Show I could observe, in concentrated form, the nexus of people and photographic art. How do people interact with photography? How do they look at photographic prints; how close do they stand to the art; how do they handle actual prints; what questions do they pose to the dealers or discuss with others also viewing the show; what do they “like” or care about? The photographs you’re about to see will answer some of these questions, but more so they will validate the questions as ones worth asking. After viewing this photo essay you may have your own questions or perceptions about “photography as art,” and you might ponder more than you have before the nexus of photographic art and your own life. Judah S. Harris is a photographer, filmmaker, speaker and writer. You can see more of his work at http://www.judahsharris.com and http://www.judahsharris.com/prints.